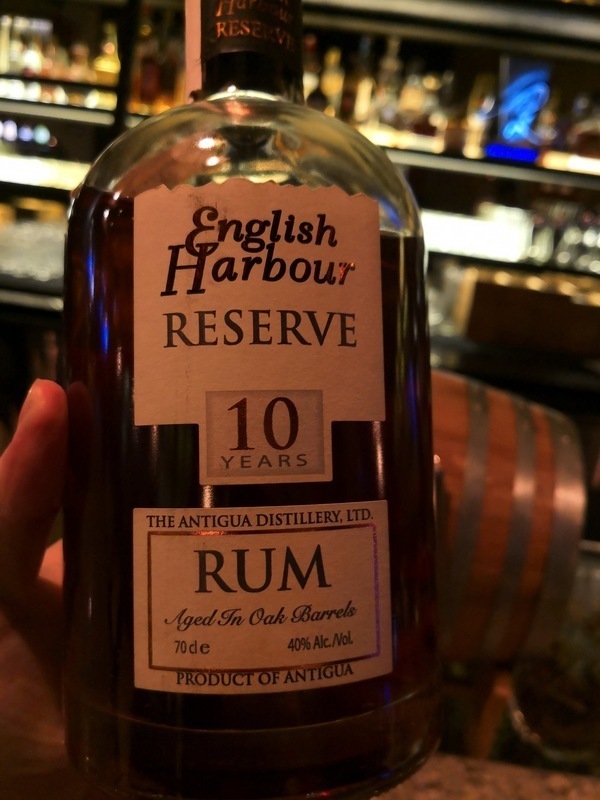 Have you found an online vendor selling English Harbour 10-Year? Rums under the English Harbour label are produced from fermented molasses via copper pot distillation. Maturation takes place in small 220 litre x-whisky and bourbon barrels. This 'Reserve' bottling has been aged for a minimum of 10 years, with components up to 25 years of age included in the final blend. This a good rum for sipping. A little ice mellows down the small burn and improves the taste. The price is in my opinion to high for this rum. Next wil be the English Harbour 1981. Cruising through the Eastern Caribbean, I had my shopping list I had prepared early on. I did not have the 10 year old on my list, but, having found it to very elusive, my quest was laid out for me. After an afternoon of searching, I found one bottle. I saved it to share with my son. It was worthy, all that I sought in a really good rum. I have difficulty in finding it close by here in Florida, as is even the 5 year old. Fortunately, I have friends that appreciate a variety of good spirits, and will shop as we travel. May your spirit be with you in your search of heavenly nectar so. 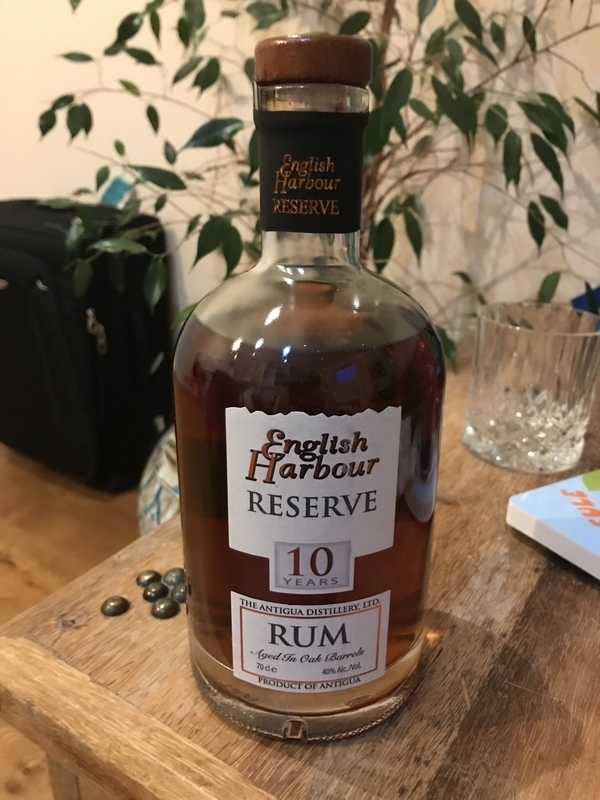 Purchased this due to my love of English Harbour 5 year. I is better than the 5 year but only slightly. Would give it an 8.5 if i could. Surprisingly, not very sweet but has a great finish of vanilla. This is a delicious rum for sipping neat because it has an abundance of warm flavors...toffee, coffee, vanilla, burnt sugar and some spice. It's mighty fine and perhaps worth a nine rating but the price (US $95) knocks it down a solid notch. I can buy 4 bottles of Seale 10yo rum for less than the price of just 1 bottle of this rum, also 10 years old. No contest. This rum has an initial sweetness to it, albeit mild, that is overtaken by a nice buttery spiciness with oak undertones. It has a decent burn to it but is not harsh at all. Then the burns fades into a bit of vanilla and caramel with a little bitterness leaving the tongue tingling. Definitely a fine rum. For me this is not a sipping rum but others might enjoy it as such. I prefer it in Coke Zero. Smells of oak, bourbon, molasses, toffee, and vanilla. The taste adds some spice. It’s a bit dry for my liking, but smooth and easy drinking. This is a good dry rum. However, I prefer a touch more sweetness. We brought a bottle back from Antigua and I really enjoyed sipping it. In fact, I enjoyed it so much... it is now gone. I got a bottle of the 1981 for Christmas, so I'm happy now. I tried this only as the 1981 25 year old had only a dribble left in the bottle at the famous Rum Bar in the beautiful Whitsunday Isles in North Queensland recently.. what a nice experience the 10 year old was. Sweet and strong with toffee , burnt brown sugar , with a lovely spiceyness thats smoothes the sweetness out. Didn't think I would have so much appreciation for a youngish rum. You can even taste molasses from the barrel in there. Cant wait to try the 1981 one day if I can find one ! Amazing stuff. I love subtle taste of this bottle and strong favlour. 40% ABV. Formerly XO. 10-12yo. A little dryer than 5. Not as fruity, nor as smooth (more sugar added to the 5?). Earthy. Some bite despite the low strength. A perfectly enjoyable sipper, but rather tame and boring. Leathery paper box in the glass then follow with marmalade and toast, cereal with mixed dried fruits (raisins, banana) and dried coconut. Spicy, dry ashy wood. Crusty apple pie with pecan and coco powder. Sweet mango flambé with brandy and cinnamon. Charred dry ashy wood finishing with sweet spices. I’m a fan of English Harbour and this one doesn’t disappoint me. Very dry and oaky. Can’t compete with the 1981 but a fantastic rum which I always enjoy when I find the way to the bottle. Picture: My English Harbour shelf. Brought a bottle back from Antigua and waited a bit to try it. Wasn’t sure what to expect but was pleasantly surprised. Initially I found the aroma a little weak. The usual demarra, caramel and vanilla essences but just that little bit lacking. I was however impressed by the taste and texture. Really smooth, almost syrupy in the mouth with a light burn in the nose and warmth on the way down. Surprisingly not that sweet but still has the main vanilla and molasses coming through. However, the taste didn’t linger too long, which was a bit disappointing. All in all an ok rum that I wouldn’t be unhappy to be given but will probably not buy again as there are others in the same price range that are better. It has been a few years since I tried the English Harbour 5y and I remember it to be very harsh. The 10y English Harbour is not harsh at all, but simply super dry. It would easily score 7 if you are a fan boy for dry rums, but I like mine sweet, so it gets a 5. Quite a smooth Rum this..not too vanillery (if thats a word). Cost from Antigua on holiday was a little on the high side tbh. I bought a bottle back from Antigua as a souvenir. A little too much alcohol in the nose but a really good sipping rum. I found a little splash of water improved the overall flavour. Really enjoyed my first taste of this offering from Antigua. From the first look at the classy bottle, a solid proper cork and a wonderful colour, i wasn't disappointed. Very smooth sipping rum, very little if any burn, and a lasting taste, that somehow reminds me of leather, puts this rum in my " not to be mixed" group. Mixing this with anything other than ice or a drop of water would be doing the rum a disservice in my opinion.